Play has magical power which we can use to build relations, dispel tension and even solve problems. It sometimes helps to express emotions, teaches us how to cooperate and lets us go beyond the stereotypical roles. It also invites us to the world in which anything can happen. 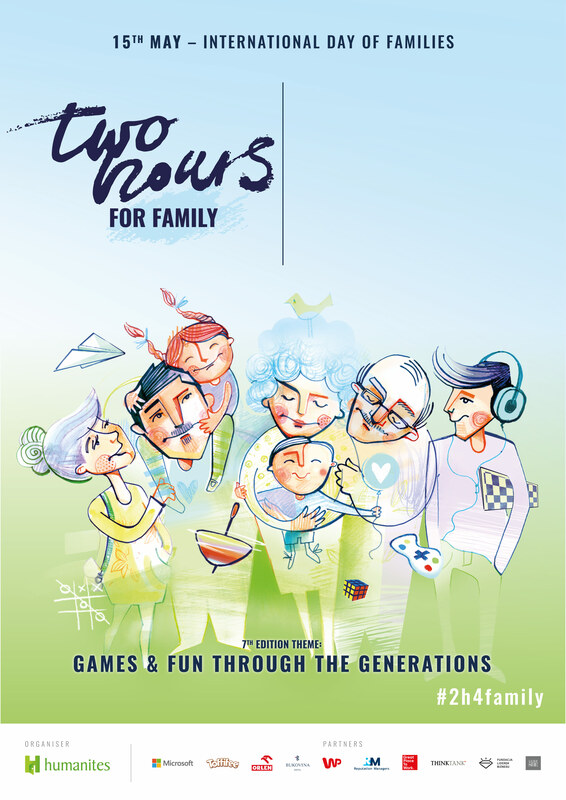 The Humanities Foundation would like to invite everyone to join the 7th edition of the social campaign for strong family relations called the Two Hours For Family. In 2012 our campaign initiated the Polish celebrations of the International Day of Families in Poland. 15th May – the International Day of Families – is a perfect opportunity to stop for a while and think what is important to us. Nowadays when the pressure and fast pace of living dictate the conditions, such a moment for reflection may be particularly important. Let us therefore ask ourselves a few questions: When was the last time I found out something new about my family and friends? When was the last time we spend some time together simply enjoying each other’s presence? 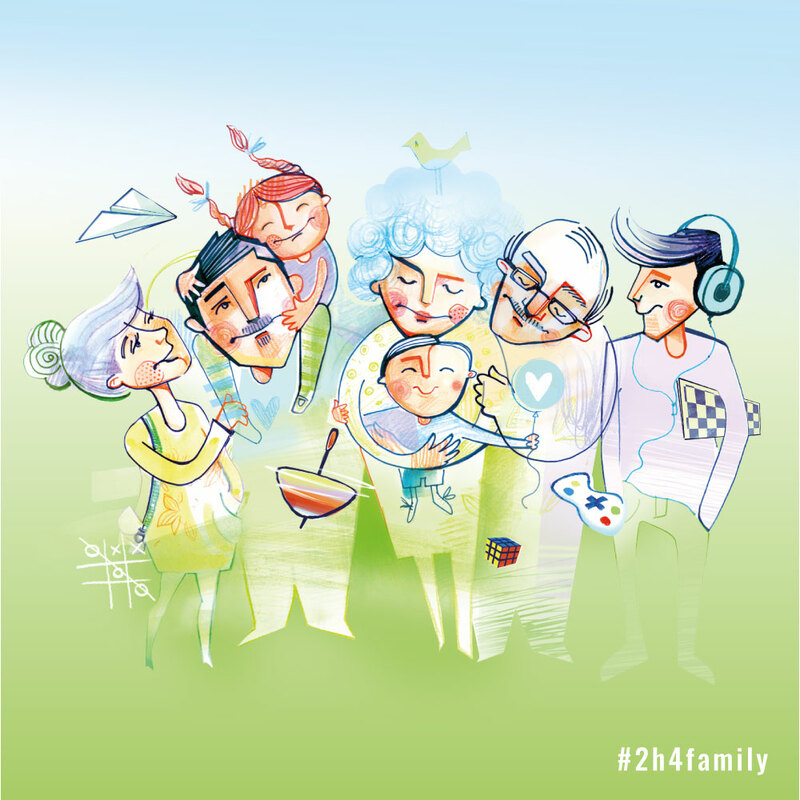 The idea of strengthening the relationship with our nearest and dearest is the key purpose of the Two Hours For Family campaign. We believe that curiosity, mindfulness and good conversations create beautiful, real bonds and that the indispensable element of that puzzle is time. We would like to encourage you to support your employees in building the relationships with their families and give them the symbolic two hours, which they will be able to devote to some magical moments with their families. The main theme of this year’s campaign is: GAMES AND FUN THROUGH THE GENERATIONS. At work games are often used for the purposes of team integration and involvement building. This year’s campaign will be a pretext for inviting employees and their families to join the fun, and build their relationships at home and at work. These two places – home and work – are intertwined and strongly affect one another, since we all play multiple roles at the same time. Pass this information to the relevant department (HR, CSR, etc.). 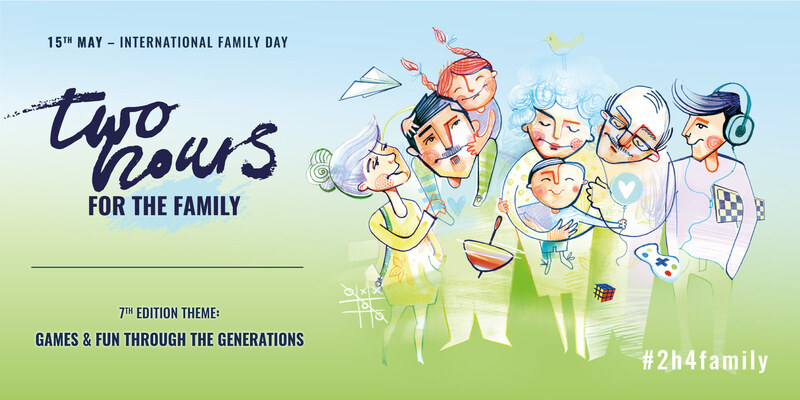 Send the information to employees, inviting them to celebrate the Day of Families by enjoying a good, intergenerational conversation. Example of a letter to employees. Reduce your employees’ worktime on 15th May by 2 HOURS or if your company’s operational activity does not allow for it (customer service, continuous production process, etc.) propose a different way of celebrating this occasion in the upcoming days, e.g. combined with the Children’s Day. Last year more than 90% of the companies participating in the campaign gave 2 hours off to their employees. The primary main aim of the campaign is not reducing the working hours on that day – but to inspire you and your employees to spend time on a good conversation, memories, get to know each other, search together for identity of their family as well as strengthen their family ties. 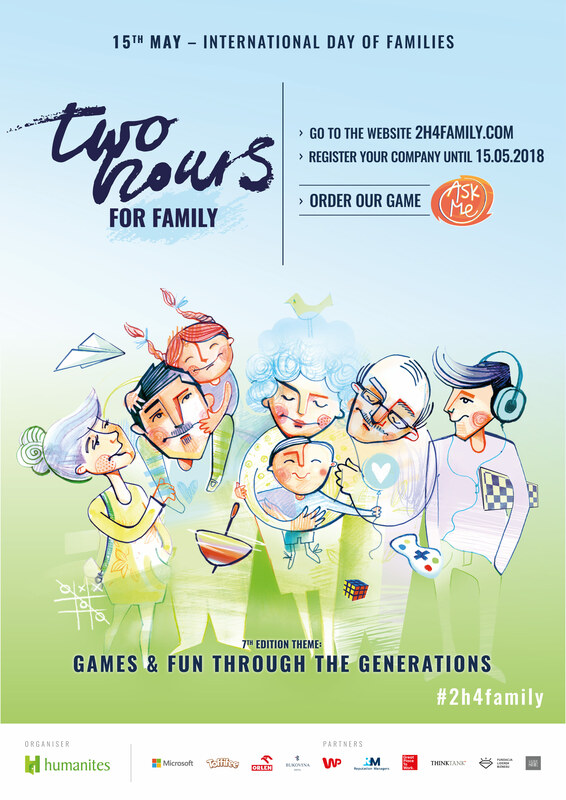 We would like to invite you to join the competition for the most interesting implementation of the Two Hours For Family campaign in a company. 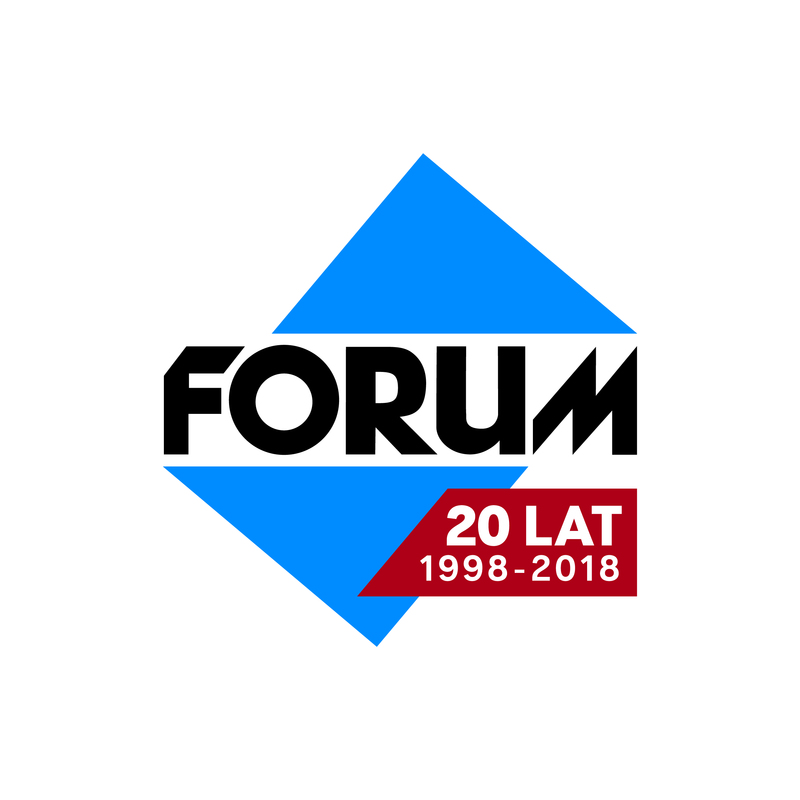 The awarded cases will be presented during a meeting summarizing this year’s edition of the Campaign and described at 2godzinydlarodziny.pl / 2h4family.com. Become the Ambassador of the Global Social Movement “TWO HOURS FOR FAMILY”. If your company is a branch/subsidiary of a foreign company or you are a Polish company with subsidiaries abroad, invite them to join the Campaign. Become a part of the international movement for strong family relations. For the seventh year running, with great joy, we’re invite all employers to take part in the Two Hours for the Family social campaign. After 6 years of our activities, our campaign has expanded beyond Poland to become a response to global labour market challenges: the battle for talent, the integration of professional and personal life, and employer branding or labour market. For this occasion, we’ve created the family game ASK ME, which helps players open up, learn about each other, and strengthen mutual bonds. Dedicated to families, ASK ME it is a game without points, competitiveness, and winners and losers. It is a game which teaches curiosity, cooperation, listening, and storytelling, shapes empathic attitudes, and promotes intergenerational integrationJ. ASK ME – available for purchase – would make a great gift to your employees. All details can be found at 2h4family.com. The question of role-playing games in childhood development was raised at this year’s Davos World Economic Forum. As research shows, role-play equips children with the skills necessary to manage their lives, including emotional intelligence, creativity, and problem-solving skills. Remember that children learn and imitate us adults. That’s why you may want to ask yourself the question: How much fun and joy is there in our lives? With our fast-paced lives, strict schedules, and pressure to achieve, we forget about what’s most important – happiness, joy and love. It is sad, but many parents and educators have forgotten the importance of fun. Research shows that over the last 30 years, the time that children spend playing has dropped dramatically. In some countries, two out of three children complain that their parents organize too many extra-curricular activities, and 49% of parents feel that it is difficult for them to find time to play with their child. The labour market is changing. Employers face a huge challenge: attracting and keeping the best employees. The concept of professional success is being redefined. 56% of employees surveyed defined professional success as “the opportunity to maintain a balance between work and private life”. 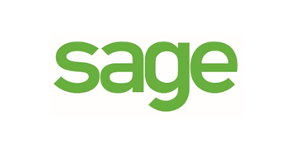 Consequently, 52% of the employees surveyed have rejected a job offer because of concerns that it would impede their work/life balance. Employees choose to cooperate with organizations that share their values and have a specific social purpose. 83% percent of consumers would change brands if another, offering similar quality, supported a worthy cause. This trend also applies to employees – social goals are becoming a decisive factor for business. New generations entering the labour market show a high degree of social orientation and clear priorities. Yes, they want good salaries, but they also want their work to make sense and be meaningful. To be a company which is successful both financially and in terms of social involvement, employers have to move away from random, spontaneous charitable initiatives to a strategic approach to creating systemic social change. Culture and Media – these have great influence in shaping society. The Two Hours for the Family social campaign engages all these areas in the implementation of one common goal. We believe that the reconstruction and strengthening of intergenerational family and social ties is the foundation for the development of the next generation’s identity. These days, the family, its environment, and its functions are constantly changing. These changes result from social and economic developments, as well as many other factors. On the one hand, we observe the erosion of traditional family patterns and relationships, and on the other hand, the question arises – what family values and models should we replace them with? We believe that business is a key force for social change, which is why the Two Hours for the Family campaign is targeted at employers, and through them to their employees and their families. The campaign reaches more people every year. Last year’s edition was embraced by several hundred companies, large capital groups and public institutions, as well as universities and local governments in Poland and abroad. Among them were such companies as: Alior Bank, Allianz, Aviva, ATM, ATOS, AXA, Bosch, EFL Group, ENEL-MED, Erbud Group, Electrolux, GFK Polonia, Great Place to Work, ING Life, K2, MetLife, Microsoft, PKN ORLEN Group, Oracle, Pentacomp, PKO PTE, PKO BP Group, PwC, Questa, Siemens, Tauron Group, Tchibo, Wedel, Wirtualna Polska, EY, and many, many more. Important social objectives cannot be achieved without cooperation. Therefore, we warmly invite employers in Poland and around the world to take part in the Two Hours for the Family campaign. We sincerely hope that our joint actions will become a global movement for deepening relationships with loved ones. More information and the application form can be found at 2h4family.com. Please share this information with your business partners. Inspire others to act. For seven years the Humanites Foundation has been inspiring Poles to celebrate the International Day of Families by participating in the Two Hours for Family campaign. The idea is to stop and reflect on family relationships, spend time on an interesting conversation that will reveal the new, unknown face of our loved ones. The author of this slogan and laureate of our contest is Ms. Natalia Noculak. Also this year, the Campaign will be accompanied by a competition for the slogan, which will be the motto of the next VIII edition in 2019. We will accept entries from 7th till 25th May, 2018. Enjoy! Humanites Foundation – initiator and organizer of the celebration of the International Day of Family and Campaign “Two Hours for the Family”. Daily communication is often based on the exchange of current events, often it does not take into account the name of the deepest feelings and desires. We do not have time to remember and dream together, and often not only time but also context for the conversation, especially when we feel that we are moving away from each other. For example, when to ask an adolescent about dreams when it is already alive in another world? How to ask, to get an answer? ASK ME game is an opportunity to touch these topics in an original and cheerful way, because … after all, the game is just a game, but is it really only? We know that your participation in the Two Hours for Family Campain is an expression of broad view of employees and appreciation of their social and family role, not just professional. 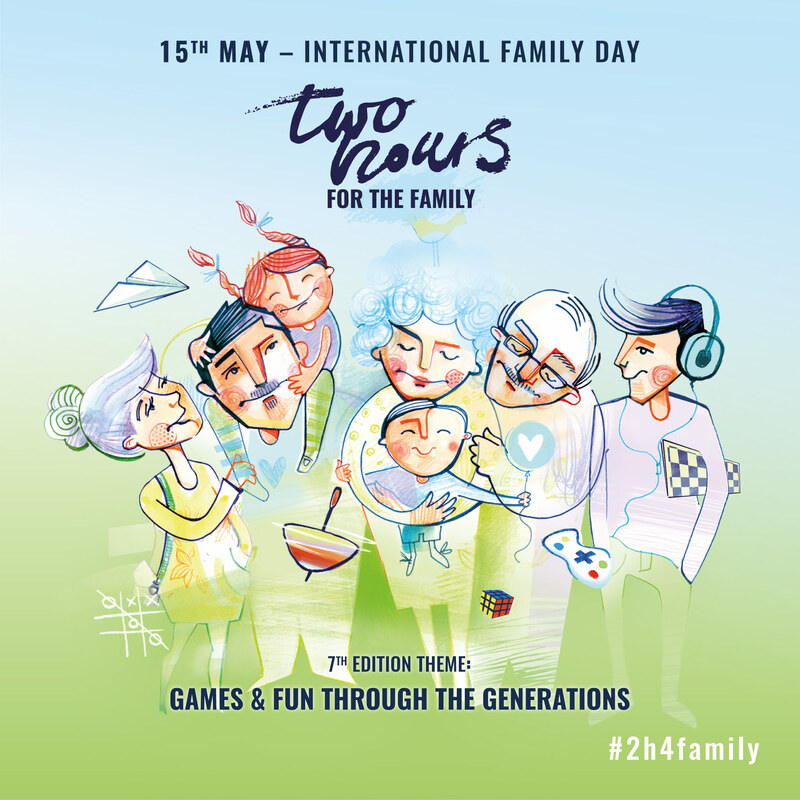 On the occasion of the International Day of Families, you can give them not only 2 hours, but also this game to inspire and support them in building relationships with loved ones. 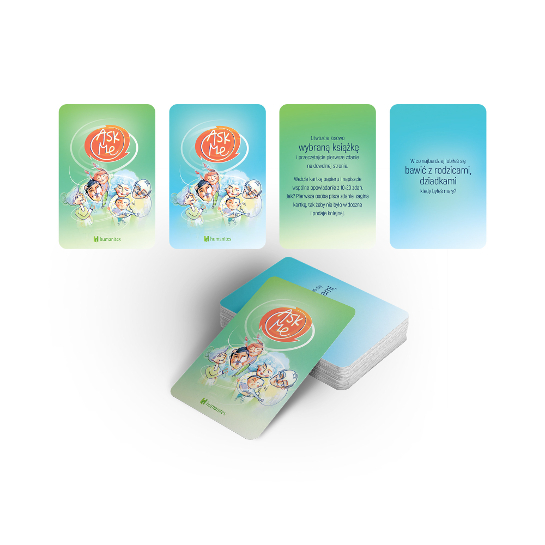 The game contains two types of cards: questions and tasks. The questions make us discover again, we open ourselves, we approach each other. Questions inspire and stimulate. In this game, curiosity dictates the conditions. What inspires my husband? What does my wife feel? What is my son passion? What does the world look like through my daughter’s eyes? What does mom dream about? What does grandpa want in his life? What does grandma miss? What does dad mention from his youth? Tasks are an invitation to play together, where we experience cooperation and joy, build family relationships, share experience and collect new memories. ASK ME is a game that relates to the relationship in the family, as well as the personality of each player. It is a game that opens emotionally and focuses on what is good and beautiful. The time we spend to discover how diverse and interesting our family is, will pay off for us to strengthen our relationship and sense of belonging. Time is one of the most valuable resources, we are constantly missing it, somewhere we are in a hurry, and the most important things are often put off for later, which never comes. We have many roles, duties, interests and other commitments. What to choose? There is no patent to increase the amount of time for the family, but we can take care of its quality. When making a choice, how we spend time with our loved ones, let us remember that these moments will become a part of one’s memories. Four-year-olds, teenagers, parents, grandparents, cousins, aunts and uncles. Just for the whole family. To create an atmosphere of closeness, deepen communication and relationship with family, find common interests, talk about dreams, needs, memories. And all this to make us feel loved. By purchasing ASK Me cards, you support the idea of ​​the Two Hours for Family. Revenues obtained from sales support the activities of the Humanites Foundation (humanites.pl). Each of us knows that you do not need much to enjoy yourself. It used to be a cardboard box to create a doll house, blocks to build towers, a blanket to create a tent. All it took was a piece of string, a beater, rubber, skipping rope, caps, chalk, or a ball to fill yourselves and your friends with fun for the day. We want to invite you on a sentimental journey to the times of your youth and recall such backyard hits as: playing classes, jumping in gum, two fires, caps, cells and many, many more. We also invite you to co-create the series: GENERATION GAMES. Send descriptions of your favourite games and your backyard stories to our address: 2h4family@humanites.pl, and we will publish them here.